It's not hard to understand why donuts make our lives so good. They're colorful, they're tasty and for some reason, it's acceptable to have them for breakfast. It's funny how one cheap food item can stand for so much. That special donut feeling starts when you're small. Like the time you get to go on errands with Grandpa and you know he's going to stop and let you get a donut. Then in school, the whole class got donuts on some special Fridays and all the sudden that quiz that is looming in Spanish class in your second period doesn't seem so wicked. And now, as adults, we get to eat donuts whenever we want! How great is this independence thing? Bum bags are back for a reason. They're just so handy! The bum bag clips in the back and easily adjusts to make your bag fit just perfect. The colorful donut print simply zips up the top so it's super easy to keep your belongings safe and sound. So maybe you're putting together a chic DIY Simpsons costume. Or perhaps you're simply looking for a colorful way to keep your belongings on your body at all times. This bum bag will keep up with your colorful music festival or donut tour ensemble. 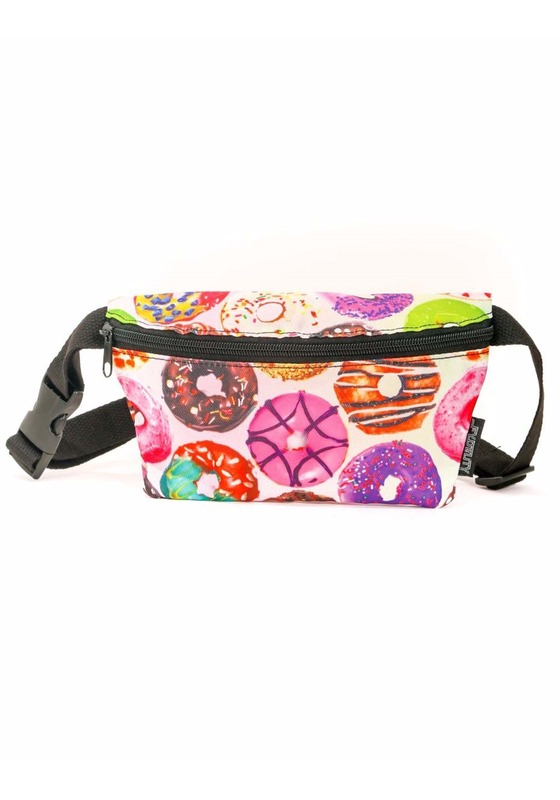 So buckle up, just like the actual treat, there's always an occasion for a donut bum bag!